I have been waiting in anticipation for cherry season, ever since I baked this Rolled Oats, Cardamon and Cherries Upside Down Cake back in July 2011. I could not shake how brilliant the trifecta flavor combination was. Long story short, after an exasperating brainstorming session, I decided to forgo the oats, and annul this oat-cherry-cardamon love triangle and stay with the happy cardamon-cherry coupling. It's clean. It's bright. It's deliciously refreshing. I really wanted to give you the 411 on cherries but instead I wish to share with you some odds and ends. Items that made me smile this week & interesting, mostly food bits, I came across. The hilarity of The Last Jewish Waiter made me smile one morning when I needed it most. I also love his posts that do not necessarily correspond to the videos. If you've been to Katz's in NYC, you would totally get it. If you haven't, I hope this will make you crack a smile. Katz's, still the best pastrami on rye out there. Smart answers in this interview Robert Sietsema's New York Taste Buds. Robert Sietsema is by far one of the most credible food critics out there. His sudden departure from The Village Voice took the food world by surprise. Although he is NYC-centric, I enjoyed his California and DC food roundups too. If you are interested in Indian cooking I love Manjula's Kitchen's videos. She is vegetarian. Manjula is not about glitz and glamour, though she does have a new hair do. Equally beautiful, her cooking is authentic and simple to follow. In a medium bowl with a lid add the cherries and 4 tablespoons of sugar. Mix and keep refrigerated overnight. Whisk the yolks lightly in a medium heat resistant bowl. Keep the ice cream containers and lids in the freezer. In a non reactive medium sauce pan with a heavy bottom add the milk, sugar and cardamon. Split the vanilla bean and scrape the seeds from the inside. Add the scraped seeds and bean to the milk. Turn the heat to low medium heat and mix with a spatula once or twice to make sure the sugar is dissolved. Once bubbles start appearing around the edge of the pot, add 1/2 cup of the warm milk into the egg yolks in 2-3 increments while constantly whisking the egg yolks. This process is called tempering. Add the tempered egg yolks into the sauce pan while constantly whisking for up to 10 minutes. The milk/yolk mixture will turn into a light thin custard. Remove from the heat and pour the custard base into a heat resistant bowl with a lid. Let completely cool and refrigerate overnight. Whip the whipping cream in a mixer on medium/high speed until stiff. Strain the custard base through a sieve into the whipping cream and mix well with a rubber spatula. Churn in an ice cream maker according to manufacturer's instructions. Once it reaches a soft serve consistency, strain the cherries and add them to the ice cream maker. Churn for a few seconds longer until the cherries are evenly incorporated. Scoop into the pre-chilled containers. Cover with a lid and keep in the freezer, ideally overnight, before serving. If you do not own an ice cream maker, look at the tips in this Salted Caramel Ice Cream post for an alternative ice cream making method. 1. Save the egg whites for meringue cookies or macarons. 2. Save the macerated cherry juice/liquid. It's delicious. Use it to moisten cakes or infuse custards. 3. More often than not I skip or forget to pre-chill the ice cream containers and lids in the freezer, but when I do remember, I get an unexplained enormous sense of satisfaction. I even chilled the rubber spatula I used to scoop the churned ice cream from the ice cream maker into the chilled containers. No guarantees I will be as good next time, but it's a good tip regardless. Yes. I thought the combination is a nice refreshing twist on the familiar & come over have a couple of scoops. :) Hot & muggy here too! אבל גם העוגה שהכנת מוצאת חן בעיני - עם הקוואקר, ובטח שגלידה!! Thanks Winnie. I use a cherry pitter I am happy I eventually purchased two years ago. Though you have to be careful not to slam your fingers while pitting with this gadget. :) Sending you a couple virtual scoops. your pictures are absolutely stunning, shulie! i've never tried cherries and cardamon as a combination but it sounds absolutely wonderful. must must give it a try soon. Do it. Do it, An. It's delicious. Thx for stopping by, It's been too long. 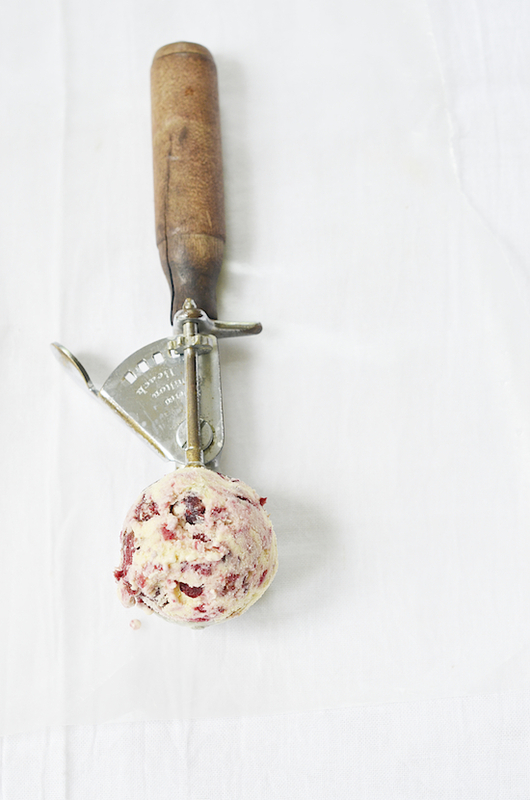 My parents would make cherry ice cream during the summer when I was a kid. This brought back so many memories and I thank you very much for that. They didn't have cardamon in their recipe and I think it is a brilliant addition. Aww Renee I am happy it brought up some nostalgia & TY. If you ever arrive home to find your house broken into and only your cute vintage props missing - it was me. Well... don't call the cops cuz it might not be but I want it to be me lol ;) PS love this ice cream too!! This reminds me that I need to make the cherry cobbler that I haven't done in awhile. But this time I might try some cardamom. Thanks! Let me know how you like the added twist of cardamon once you make your cherry cobbler. That is one delightful flavor combination! Your ice cream must taste exceptionally good. Cardamon and Cherry sounds like a food marriage and you coupled them quite well. I am in love with your pictures too, quite inspiring and I actually started to wish that summer would come back so that I could make your ice cream (saw some cherries in the market the other day!). 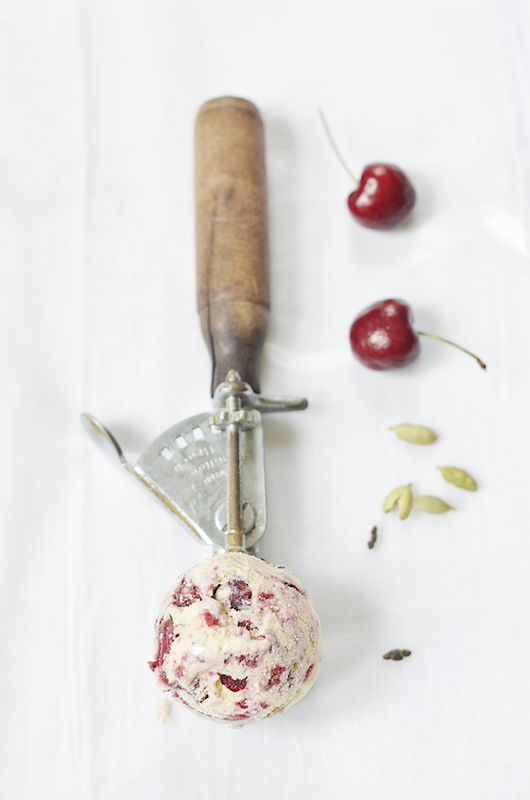 I keep hearing about cardamom and cherries and it seems that it's about time for me to try these two flavors together. And I can't think of a better way than your ice cream. And as always stunning pictures and that ice scream scoop is awesome with a Capital A! Yum!!! This would pair nicely with our post from today!!! Lovely! Hurried right over and indeed it will be a pairing made in heaven! So beautiful, my friend. I want to frame these photographs! I just love how you displayed the ice cream in the scoop. So very inspiring. Thank you for sharing! Here's to cherry season! TY Monet. I was happy cherry season is early this year. I have some frozen cherries from last summer, to cheer up my current winter, but now I hesitate about how to use them. With cardamom is the perfect thing Shulie, I really started using it last year and it´s at the top of my chart. Such a gorgeous ice cream! And I love your ice cream spoon. Grazie del commento nel mio blog. I am super excited to find your website and this amazing recipe! It is absolutely brilliant! I am honored to feature your fantastic recipe in my "Top-Rated Ice Cream Recipes Round-Up" on my website! I will definitely be back! Good catch! Thank you. I just fixed it. It's cups and teaspoon. Refer to the corrected recipe. Have fun making ice cream. It's easier than you think.